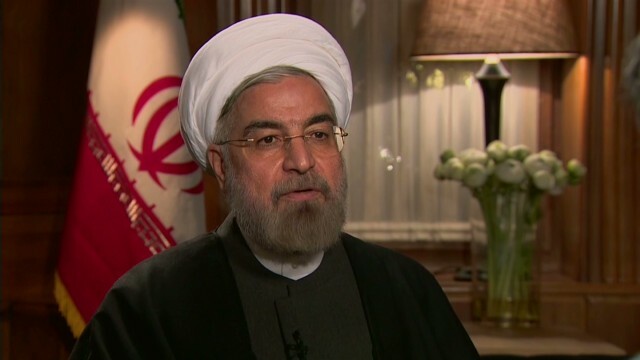 CNN’s Fareed Zakaria GPS features an interview with Iranian President Hassan Rouhani. He spoke with Fareed about the nuclear negotiations, the sanctions regime, and Syria’s civil war. FAREED ZAKARIA, HOST: President Rouhani, it is a great honor to have you. PRES. HASSAN ROUHANI, IRAN: I am also happy to be here. FAREED: In an interview last week with “The New Yorker” magazine, President Obama said that he thought there was a 50-50 chance of completing a comprehensive agreement with Iran, not the interim one that’s just been signed. But there are a few crucial issues which seem to me make it quite difficult. Um, there is a widespread feeling in the United States and France, in many Western countries, that Iran should have almost no enrichment capability, uh, that it should, instead, get its enriched uranium from outside. You said in an interview with “The Financial Times,” Iran will absolutely re— retain its enrichment. Do you believe that it will be possible to bridge this gap by allow — by allowing Iran to have a small enrichment capacity, but, for the most part, to forego enrichment? ROUHANI: Iran will not accept this. And the peaceful nuclear technology, including enrichment, is part and parcel of the inalienable rights of states. We are only willing to move forward within legal context. If somebody wants to talk with us outside these legal contexts, that’s — that tells us that they don’t want to have an agreement. When it comes to nuclear technology, the Iranian people are very sensitive. It is a part of our national pride and nuclear technology has become indigenous. And recently, we have managed to secure very considerable prowess with regards to the fabrication of centrifuges. So in the context of R&D and peaceful nuclear technology, we will not accept any limitations and in accordance with or parliament law, in the future, we are going to need 20,000 megawatts of nuclear power. We are determined to provide for the nuclear fuel of such plants inside the country, at the hands of local Iranian scientists. We are going to follow on this path. ZAKARIA: So there will be no destruction of centrifuges, of existing centrifuges? ROUHANI: No. No, not at all. ZAKARIA: This feels as if there is a — a big divide here. Do you think, in your understanding of the negotiations, that the two sides are — that there is enough goodwill, that there is enough trust that there can be a bridge between what seem to be very different positions? ROUHANI: Of course one cannot say there is full confidence and trust. These negotiations, one of the goals of the negotiations is to create trust. The six month implementation of the initial agreement has been devised to provide more confidence. There are certain conditions when it comes to certain countries and confidence cannot come about easily. The Iranian people, with regards to the policies of various American administrations in the past 30 years, are very worried. They don’t trust them. So this trust needs to be built. This is a newly founded structure. We only have the foundations in place. We need to bolster the foundations, to be very precise, to have a beautiful building, we need time. ZAKARIA: You know, I’m sure, that in the United States Congress, there is a debate about a bill which would put — impose further sanctions on Iran, if, after the six month period, the negotiations — the — the permanent negotiations were unsuccessful. What is your reaction to that potential, uh, legislation from the U.S. Congress? ROUHANI: At face value, the U.S. Congress, there is a — they have a long way to go before they fully appreciate and understand Iranian people. And to know that when, from a religious point of view, religious leaders, to be more specific, the great and eminent leader of the revolution, announces and states that the fabrication and the stockpiling of nuclear weapons is haram, religiously forbidden, this should tell you that we don’t want to build the bomb. So when it comes to sanctions, have they been successful so far? Sanctions, first and foremost, are illegal. And a Congress which claims to be making laws should not contravene international laws. So these sanctions translate into the weakening of the NPT, the weakening of international laws and regulations. No other country can decide for another country. ZAKARIA: Looking at regional issues, when Iran has presented itself, it has often seen itself as a more open government than perhaps some in the Middle East and a more moral government. And yet you support the government of Hafez Al-Assad — I mean of Bashar Assad that has, by some accounts, killed 200,000 or 300,000 people, caused millions of people to flee. Uh, there is widespread killing, suffering in Syria. How can the government of Iran support the regime of Bashar al- — al-Assad? ROUHANI: Well, in a civil war, you cannot just consider one party’s position. What has created a huge problem for the region today is terrorism. You know well, governments know well, even Western governments know well that all terrorist groups, the most dangerous terrorists have converged inside Syria. And unfortunately, some countries are providing means and money to these terrorists. The Bashar Assad government has been there for some years now. It has been running the country for some years now. And if the people have some grievances, they need to go through legal channels, engage in free elections to — for everyone to find out what the people need. Today, a civil war rages inside Syria. We should come together to stop that. ZAKARIA: Would you support, if you had been at the — the Syrian talks, would Iran support a process which would lead to genuinely free and fair elections, even if that meant the removal of the Assad regime? ROUHANI: Well, we — well, the issue of Bashar Assad is not the main issue here. First, we need to push the terrorists out. We should all work — work together to prevent access to terrorists. I’m seeing — I’m sure you have seen these videos, what the terrorists are doing, how brutal they are. And first, so terrorists need to leave the country. So all countries need to come together, work hand in hand. Later, conditions should be helped to come about, those who oppose the Syrian government should sit at a table with the Syrian government. A conducive atmosphere should be helped to come about. Then, whatever the Syrians decide, that is fine. Of course, the Syrian people have the right and every right, in this road, whatever help we can provide, we will not fail to do so. ZAKARIA: Mr. President, during the campaign, you, uh, you were quoted once as saying, “It is not enough to say ‘Death To America!’ with words, we must show what we mean by ‘Death To America!’ in action. What do you mean, uh, by putting the — the phrase, “Death To America!” in action? ROUHANI: Well, the people, when they say “Death To America!” do you know what they are really saying? What they mean to say relates to the aggressive policies of the U.S. and intervention and meddling by the US. We don’t want those to continue. We want people to decide for themselves. All countries in my part of — part of the world, rather, I want democracy, or, rather, we want democracy to prevail. I told the people, if you want American policies to stop, we need to take action. We need to make the US understand that its meddling is inappropriate. ZAKARIA: Would you like to see Iran have normal relations with America? ROUHANI: This is totally dependent on the US. The Iranian and American peoples, for many years, used to enjoy a relationship despite the differences and difficulties we had with the U.S. administrations. So they need to change their behavior. They need to change their policies. And they will undoubtedly receive a positive response by the Iranian people. ZAKARIA: What would happen if Israel were to launch a military strike on Iran’s nuclear facilities? ROUHANI: Israel will not do that. Israel knows very well what the response would be. Israel knows well our regional capability, Iran’s capability. And we know what capabilities the Israelis have, for that matter. So with all of these in mind, these are empty slogans. When it comes to practice, the Israelis cannot do that. If they do such a crazy thing, our response will make them rue the day. ZAKARIA: Mr. President, um, you are now at the center of the world. And I think it’s fair for people to wonder, who are you? Um, and so there are some people who say that, uh, you are a real liberal in the Iranian system. There are others who say that you are a wolf in sheep’s clothing. How would you describe yourself? ROUHANI: I am an open book. I have been chosen by the people in a free and fair and competitive election, the people participated and voted for a president who was uttering the slogan of moderation and wisdom. He says that he wants to have constructive interaction with the rest of the world. So the administration or the president, for that matter, is not important. What is important is the Iranian people. The administration represents the people. In the most recent elections, the Iranian people spoke very clearly with the rest of the world. Windows have been opened. I very much hope that the rest of the world and others will use this opportunity optimally. ZAKARIA: Mr. President, it’s a great honor.